Want To Tee Off In Gorgeous Cabo? Our Baja Golf Package service ensure that you get the most from your Cabo San Lucas Vacation. Our team of golf travel professionals can help you select Cabo golf courses based on your skills and desires, budget and current course conditions. Plus, not only will you save time, you'll also save money! Our relationships with local courses, Cabo hotels, resorts and private vacation home owners allow us to pass on deep discounts on Cabo tee times and lodging. Let GolfBaja.com introduce you to the fabulous golf courses of Mexico’s Baja California Peninsula! We make it easy and affordable for you to indulge in the some of the most memorable golf you'll ever experience! Experience the unmatched tropical golf paradise of Cabo San Lucas! Stay at the Club Cascadas de Baja, an oceanfront haven featuring luxurious villas surrounded by Coco Palms and lush foliage, many with private pool or spa. Tee off at one of Los Cabos’ most famous golf courses: Cabo del Sol, Cabo Real, Eldorado Golf Course, Cabo San Lucas Country Club, or Palmilla Golf Club. Stay at the Residence Inn by Marriott in Tijuana and play up to 36 holes of golf per day at the lush Real del Mar Golf Club. The adventure of the Baja can be yours just 15 miles from the U.S. border! Lodging for Veterans and their families. Unlimited greens fees for the duration of stay. 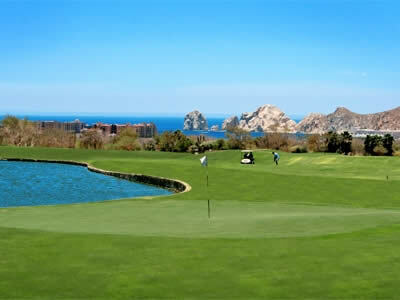 Golfers will surely enjoy this Dye designed 18-hole golf course known as the Cabo San Lucas Country Club. Set amid endless cacti and blooming Bougainvilleas, Cabo San Lucas Country Club is the area's only golf course offering views of the famed Cabo landmark, The Arch at Land's End. Each villa at the Los Cabos Golf Resort is equipped with a kitchenette or full kitchen, a large private patio or quaint terrace, daily maid service and boasts a views of the desert, the fairways or Sea of Cortez. 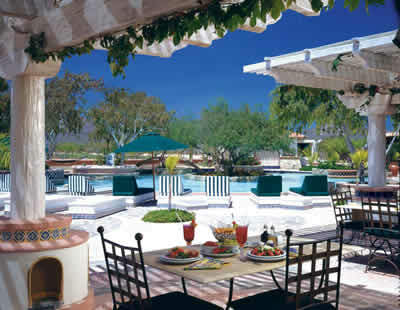 Unwind at the resort's pools, stone Jacuzzi, mini spa, or tantalize your taste buds at the Double Eagle restaurant. Los Cabos Golf Resort thanks all Veterans for their service! Offer valid for all service members and veterans deployed to Combat Zone in Southwest Asia since 9-11, plus their families. Flight, food and beverages must be covered by Veteran (or veteran's family). 90 day or less reservation window. Based upon availability. $20 cart fee not included. For Baja, Los Cabos and Cabo San Lucas golf packages, there is no better resource than GolfBaja.com. We look forward to helping you tee it up in the Baja!